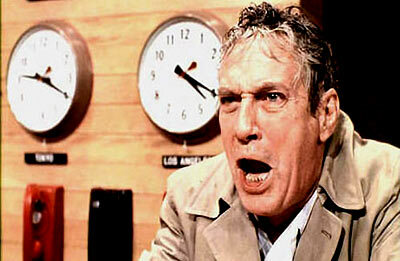 Take it away, Howard Beale: “I don’t have to tell you things are bad. Everybody knows things are bad. It’s a depression. Everybody’s out of work or scared of losing their job. The dollar buys a nickel’s worth, banks are going bust, shopkeepers keep a gun under the counter. Punks are running wild in the street and there’s nobody anywhere who seems to know what to do, and there’s no end to it. “We know the air is unfit to breathe and our food is unfit to eat, and we sit watching our TVs while some local newscaster tells us that today we had 15 homicides and 63 violent crimes, as if that’s the way it’s supposed to be. “Well, I’m not gonna leave you alone! I want you to get mad! I don’t want you to protest. I don’t want you to riot – I don’t want you to write to your congressman because I wouldn’t know what to tell you to write. I don’t know what to do about the depression and the inflation and the Russians and the crime in the street. All I know is that first you’ve got to get mad.